recommended for: Fans of If You Find Me by Emily Murdoch, Dead Girls Don't Lie by Jennifer Shaw Wolf, and other twisted, twisty mysteries. The only thing I'd really heard going into this novel was that it's beautifully written--and I was far from disappointed. In the voices of Alice's narration and Cellie's diary, Jean creates a richly layered world, dark and glittering and severely unsettling. Jean's prose is as sharp as a knife, at times sweet and at times grotesquely poetic. It was this skin-prickling atmosphere that kept me reading even when elements of the thriller were predictable or unbelievable, and it's this atmosphere that keeps this book in my memory. Alice is in a mental institution, ruled criminally insane. Again. First committed for a crime she was unwittingly party to, she's here again for a deadly fire that scarred her and killed her beloved Jason. A fire set by her twin. When wolfish bad-boy Chase seems to have information about Cellie's whereabouts, Alice recruits him to help her find her sister--and enact her revenge. Despite some are-you-serious moments (I mean, two kids escaping unseen from a state psychiatric facility? Nowadays? Unlikely. ), it's a story that hinges more on its emotional payoff than its plot-shockers. I had an inkling what might happen from the start, but I don't think the book is any less for the lack of surprise. If you read enough thrillers, you learn the patterns and the likely ends. Like any romance. Like any adventure. What distinguishes any good story is the telling. 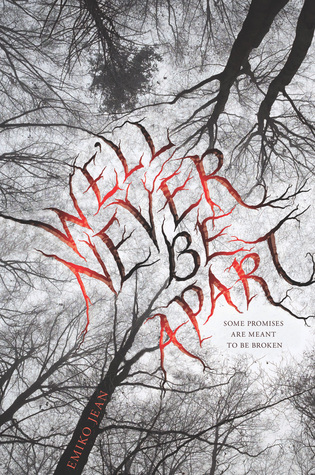 We'll Never Be Apart is one of the best young adult psychological thrillers I've ever read. 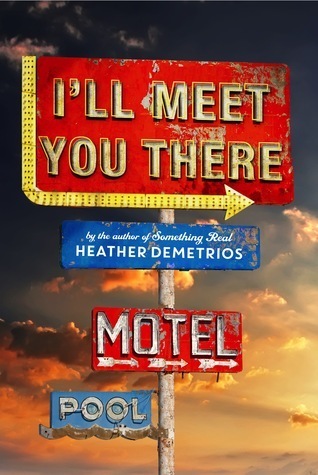 With shades of Gone Girl's he-said-she-said, it weaves together two contradictory narratives, leaving you chasing the gaps and lies until the very end. Its narrators were it for me. Alice is a hollow, distrustful wraith of herself, alive only with the fire of her grief and burning for revenge. Cellie is cold cruelty, a psychopath who protects her vulnerable heart with blood and bone. I believed them, connected fully with their emotions, sympathized with both and raged at both. And they made me believe in the unscrupulous doctors; Jason, romantic with a dark edge that keeps you at bated breath around him; Chase, liquid pain in a snarky shell. In their bleak world of hypodermic needles and chipped linoleum. I think if your enjoyment of thrillers hinges on a totally unexpected reveal, you'll be disappointed. If you're more interested in a brutally beautiful journey, then this is one to pick up. We'll Never Be Apart is a beautifully-written exploration of dark, broken minds. I LOVE the sound of this. I don't mind predictable stories as long as they're well written. You also got me at its emotional aspect. Great review, CJ! I'm adding this to my tbr! Same here! Most stories are predictable for me, so I'd rather read something predictable and pretty than something totally unique that sounds like crap. Thanks! Hope you like it! YAY have I told you recently that we're book twins!? <3 Thank you! Ooo, this one sounds super interesting! It's always great to hear about YA thrillers because I feel like there aren't enough of them! Same! I'm not sure why that is. Maybe there are and I just don't find them thrilling so I don't consider them thrillers. :P But more YA Gone Girls would be super great.